Double Brit award winners Manic Street Preachers have revealed their secret five-year plan. The Welsh trio will record three more albums and then split - because they don't want to end up like the Rolling Stones. Despite scooping two gongs for Best British Group and Best Album - for the second time in three years - the group have sensationally decided they want to bow out gracefully. The band's drummer Sean Moore revealed exclusively to us: "Another five years will be enough. That will be it." And in a dig at Mick Jagger and Co, he said: "We are not the Rolling Stones. We never wanted to be the Rolling Stones". Asked if he thought the ageing rockers, currently on tour, were any good, he said simply: "No." Singer James Dean Bradfield, bassist Nicky Wire an Sean have not even told their record bosses about their plan. In fact, until last night only a handful of people were in the know. "We have discussed it among ourselves," said Sean. "We feel that is as far as we should go. "I think the fans will come to the conclusion that another five years is enough for this band." The news will come as a major blow to the group's army of adoring, sometimes obsessive, fans. The Manics only recently achieved major success. Last year they notched up their first ever No.1, If You Tolerate This Your Children Will Be Next, taken off their award-winning album This Is My Truth Tell Me Yours. And at the 1997 Brits, they scooped a gong for Everything Must Go, their first album after the disappearance of guitarist and main lyricist Richey Edwards. 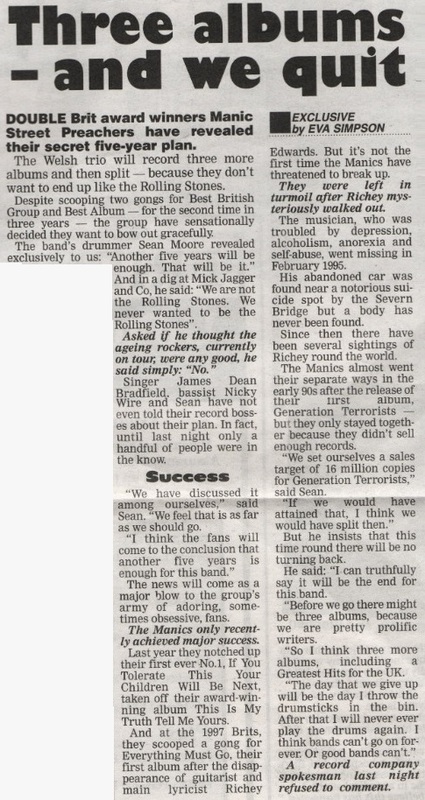 But it's not the first time the Manics have threatened to break up. They were left in turmoil after Richey mysteriously walked out. The musician, who was troubled by depression, alcoholism, anorexia and self-abuse, went missing in February 1995. His abandoned car was found near a notorious suicide spot by the Severn Bridge but a body has never been found. Since then there have been several sightings of Richey round the world. The Manics almost went their separate ways in the early 90s after the release of their debut album Generation Terrorists but they only stayed together because they didn't sell enough records. "If we would have attained that, I think we would have split then." But he insists that this time round there will be no turning back. He said: "I truthfully say it will be the end for this band." "Before we go there might be three albums, because we are pretty prolific writers." "So I think three more albums including a Greatest Hits for the UK. "The day that we give up will be the day I throw the drumsticks in the bin. After that I will never ever play the drums again. I think bands can't go on forever. Or good bands can't." A record company spokesman last night refused to comment. This page was last modified on 23 May 2018, at 04:29.